7 Train-Hudson Yards Stop. We are also located 4 blocks from 34th Street/Penn Station. Belcampo’s promise is to serve the highest quality meat anywhere —compassionately and sustainably raised on our farms, and of course, incomparably delicious. The way we do things shouldn’t be revolutionary. But it is. We believe that healthy animals and a happy planet is not only the best way, it’s the only way. And that the right decisions just taste better. From our take on classic steak frites to an epic mixed grill, to the perfect dry-aged burger, you’ll find all our favorite meat dishes — each filled with California farm-raised goodness. Grass-fed & finished beef sirloin, egg yolk, shallot, capers, grilled bread. Crispy duck confit, duck fat fries, duck gravy, white cheddar. Limited production belcampo charcuterie selection. Beef sirloin, crispy capers, red onion, parmigiano reggiano, arugula, olive oil, lemon, grilled bread. Grass-fed & finished dry aged grilled beef, broccoli rabe, sautéed spinach, black garlic vinaigrette. Chicken, avocado, arugula, radicchio, balsamic vinaigrette. Spiced lamb, cauliflower rice, za'atar, cherry tomato, cucumber, yogurt tahini sauce. Chicken, soft boiled farm egg, bacon, gem lettuce, cherry tomato, point reyes blue cheese, avocado, red wine vinaigrette. Crispy belcampo bacon, soft boiled farm egg, kale, anchovy, parmigiano reggiano. Baby lettuces, sugar snap peas, baby carrots, english peas, cucumber, fennel, radish, green goddess dressing. Chicken, poultry bone broth, coconut milk, lime, fish sauce, cilantro. Beef bone broth, meatballs, soft-cooked kale, parmigiano reggiano. Achiote marinated chicken, poultry bone broth, corn, avocado, cabbage, tomato. ½ lb grass-fed & finished dry aged grilled beef, duck fat fries, bordelaise, béarnaise butter. ½ lb grass-fed & finished dry aged grilled beef, roasted carrots, bordelaise, brown butter. Limited selection of our best steaks, chops, and cuts, grilled to order served with choice of fries, brussels or kale caesar. Parmesan crusted chicken breast, celery salad, lemon. Belcampo sausage of your choice - kielbasa, merguez, brat, sweet Italian or hot Italian served with kale caesar. ½ lb grass-fed & finished 28 day dry-aged beef, white cheddar, caramelized onion, butter lettuce, house sauce, brioche. Two thin grass-fed & finished beef patties, potato bun, American cheese, minced onion, pickles, belcampo ketchup, mustard. ½ lb grass-fed & finished 100 day dry aged beef, raclette cheese, caramelized onion, dijonnaise, arugula, brioche. ½ lb pastured grass-fed & finished lamb, black garlic aioli, alfalfa sprouts, brioche. Chicken breast, broccoli slaw, pickles, ciabatta. Char-grilled nitrate-free belcampo kielbasa, caraway-dill sauerkraut, piquillo pepper, stout mustard, brioche. Fried farm egg, belcampo bacon, dijonnaise, arugula, croissant. Lettuce wrapped or gluten-free buns available upon request. Vodka, cucumber & lemon juices, pear brandy, chareau aloe liqueur, mint. Copalli white rum, grapefruit & lime juices, cinnamon, cardamom bitters. Brandy, crème de peche, lemon juice, singani 63, amaro angelino. Gin, pimm's no. 1, apple brandy, house ginger beer, tangerine. Reposado tequila, mezcal, banana, orgeat, lime juice, ancho chili, sherry. Duck fat washed rye whiskey, spiced orange oleo, angostura bitters. Copalli rested rum, cacao nib sweet vermouth, bourbon, sherry, crème de cacao, toasted pecan bitters. Lager, belcampo bone broth, lime juice, fresno chili, savory spices. Aperol, strawberry brandy, passionfruit, lemon juice, sparkling wine. Celery gin, vermouth, verjus, rhubarb, celery bitters. Cola, diet cola, black cherry, lemon lime, red birch beer, root beer, ginger ale. Vintage black diamond medium roast coffee. Espresso, slow poured steamed milk. Chocolate finished with slow poured steamed milk. Cherry syrup, vanilla & chocolate drizzle, cherry candies. English breakfast, earl grey, chamomile or tropical green. Great dinner after a long day of sightseeing and shopping. Loved the burger and the steak tartare. The brussel sprouts are like crispy chips and we all loved them. This was the perfect spot to wrap up our fun day in NYC. The staff was welcoming and friendly and the food delicious! Had a really lovely lunch at Belcampo. It's a perfect spot for a casual lunch with friends, with friendly and helpful service and great quality food. My friend who had the "choose your own meats" dish was especially impressed. The only reason I didn't give a full 5 stars is that about half of the starter items on the menu were not available when we dined. Love this place!! The food is sooooo delicious. Every single thing that comes out of the kitchen is fabulous. We had a group and shared multiple dishes. Loved the steak and fries, burger, Caesar salad, steak tartare and Brussel sprouts. Great service. John is the best. Will definitely be back! Best place in Hudson yards right now amazing! Service staff were particularly friendly and helpful. Food was GREAT. Service was a bit slow, but friendly. Terrible service. Good nothing special very overrated! Not good for kids! Great service. Venue is very New York and the first place we have eaten at Hudson Yards. Menu is unique with plenty of choices. We had an early lunch so can't really comment on the noise but it looks like it has the potential to be a bit noisy. A cross between airline food and school cafeteria. I asked to have my raw steak cooked a little more and it came back presliced and grey all the way through. I actually couldn't eat it at all. The fries also went back and were returned soggy. I assume they microwaved the dish until it was inedible. I used the bathroom and the sink handle came off in my hand. Hardly a good start for a restaurant open only a week. The staff tried, but they are no match for the horrendeous environment and terrible food. No toilet tissue in the bathroom. No Bloody Mary mix. Waited on line out front til hostess told us we were in the wrong area, since we had reservations. Waitress did best she could, but was short-staffed. Food arrival was slow.And my Chenin Blanc was effervescent, so I asked for Pinot Grigio instead. Had a great time- food was amazing! Service was friendly! Don't go on weekends. Less attention to food quality control when they are busy. Excellent food and service. My only issue was that the appetizer took quite some time to be served, and I was only able to eat half when the meal then arrived. The table was very small and the plates large so there was no room and it has to be taken away. They apologized many times but really should have been timed out better. The kitchen had an equipment issue and they called in the morning to let me know the grills were not working. We took a chance since we had a 1:30 reservation and the service tech had them up and running by 2. They called us to keep us informed and were very nice about it. I had the beef carpaccio. Unfortunately their stove was not working so there was no cooked food available. However they were really good to inform me in advance of my reservation and were more than helpful in recommending other alternatives. Excellent service. Excellent restaurant. I will return. Belcampo was amazing! The food is everything you’ve heard it would be. The hype was accurate. Loved the lamb with cauliflower risotto, the steak and fries, and the brussell sprouts. The service was excellent and the staff were all really friendly. I’ll definitely be back! Got a raw lamb burger, when I reminded the waitress I asked for medium, the waitress was extremely rude in saying it was “medium” but she’d send it back to cook to “well done”. I asked for a to go box but the waitress threw it out anyway, then was reluctant to take it off the bill. Truly disgusting behavior that I’ve never experienced before. Will never come back here, and I don’t recommend. If you’re going to the mall and want a burger, you’re better off at shake shack. Great burgers and friendly casual environment!! The food was delicious. Our server was delightful! Dinner took 3+ hours. It was clear the operations of the restaurant need a lot of help. Very unfortunate. Great spot - great food - burger delish, salad with chicken delish- excellent service - they’re not taking any chances with service at this place! People are super friendly and want to make sure you leave happy! We were anxious to try the famous BelCampo burgers and it was clear that we were not alone as we watched plate after plate of burgers leaving the kitchen for hungry diners. The burgers were quite good - juicy, meaty and nicely dressed with the usual condiments. The waiter was the real stand out here. He was kind, thoughtful and made us feel very, very welcome. No petulant hipster flouncing off here, just a restaurant professional. That was so refreshing. The dining room is confusing- it's like being in a giant cave with the best (and only) views saved for the area near the bathrooms and a dessert prep area. The room feels highly generic - you could be in an airport lounge or a chain restaurant in suburbia. All in all it was a decent experience but it's not a destination dining experience. Food was great! Staff is still navigating the ropes since they just opened last week. Great overall experience. Food was cheap quality compared to the price. Great burger! Great cocktails! The Butcher to Grill is a fun concept - pick your own protein from the case and they grill it to your liking. Service is friendly and knowledgeable. Just ok it how I would describe. I looove burgers and their burger was completely forgettable. Also we ordered the steak tartare to start (which was pretty good) and the mains came 1 min after. I mentioned we just got our starter and if they could ensure when time for mains they made us fresh burger and steak. Instead it was obvious they just had kept in back for 20 min. Fries cold and burger soggy bun. Live close by and will not be coming back. Much better burgers in many places around the city. The food was fine, nothing remarkable for the price point but the service needs an upgrade. Drinks took forever, food was plopped down on the table, high level of confusion at the bar. Perhaps growing pains but was not great overall. Great experience after a morning touring the Vessel and Hudson Yards. The beef carpaccio was outstanding! I'd wait a while for them to work out the kinks. The supply chain needs some work as the food took forever to come out and a couple of the orders were wrong and they weren't flexible with the orders. Food was good when it did come, and they comped a couple of the meals and a bottle of wine, but clearly need to get the process from order to kitchen to back on the floor right. Was able to get a reservation at this place. Food was mediocre at best. Definitely need to work out the kinks - which would include making sure meat cooked at right temperature. Setting isn’t great either. Overall, worst restaurant in Hudson Yards. May change ranking after trying others. Well, we asked what they were out of when we arrived was told the wedding.soup and the sauce for one.of the burgers okay cool, no big. Went to order the butcher to grill and oppppps they dont have that. Charcuterie platter was a total RIP off. 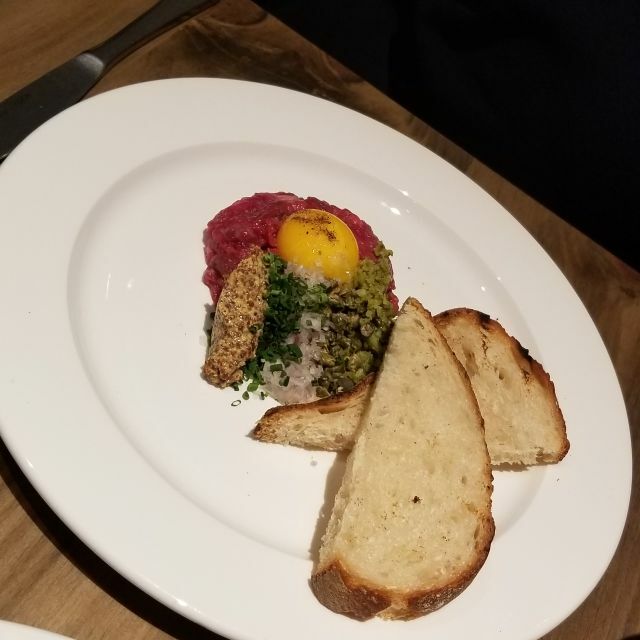 Steak Tartar was to die for but could use some finishing salt. Service was spotty at best. Ordered the steak and carrots told the server RARE, twice! I said just walk the steak past the grill. Came out med rare, immediately sent it back. New plate arrived shortly after done correctly. The duck fat cocktail and coconut milk soups were both amazballs, partner had steak fritte. Best duck fat fries ever. Truly, the most amazing hamburger I've had in NYC, and the best value. The fries are made in duck fat, and that made the meal even more spectacular. It took a long time to cook my food. It is just a salad! Scene but also Hudson Yards. The service was spot on...Servon was gracious, friendly, helpful and just what you want as a server. I had the lamb burger which was hands down the best lamb burger I have ever had. Also their “bone broth” soups are amazing. The space is comfortable and not stuffy. Thanks! We look forward to having you back soon! I would not recommend Belcampo at his time. I expect they will be a wonderful restaurant eventually. They are newly opened and they were not prepared. 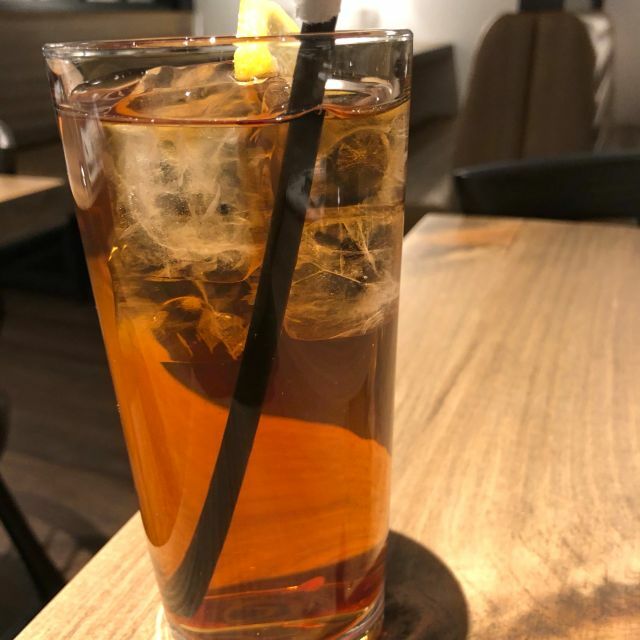 First we ordered from their specialty drink list and found they couldn't create one or our drinks because "they didn't have all the ingredients". The restaurant had only been opened for 4 days how did they run out of ingredients? Then we ordered our dinner off of the menu and was told that 1 or our 4 entrees wasn't available because "they didn't have all the ingredients". Ordered a grilled chicken sandwich (easy right?) It was so oddly bad tasting, I returned it. I NEVER return food. To the server and managers credit they were very apologetic and accommodating. Maybe in a month or 2 they will get the kinks out and have all the ingredients. Awesome Hamburger ! Delicious Kale Caesar salad! Grand Opening Event. Farm to Table. Hamburger was amazing! Diverse menu which will be expanded after opening. Will be an excellent choice for lunch or dinner in the new Hudson Yards Mall. Pricy but far from a fast food restaurant. Very high quality meat! I attended a friends and family event here at Belcampo and I was blown away by the amazing food and service, I have to say I had a 100 day dry aged burger that is the best burger I have ever tasted, plus steak and roasted carrots there meat is outstanding! Along with the drinks and this duck fat fries as an appetizer was phenomenal! I highly recommend anyone & everyone to go here!